Baked oatmeal is a classic Amish dish that is traditionally prepared with butter, milk, and eggs. This recipe is a healthier version that adds spice and everything nice with its dairy-free vegan make up. This comforting breakfast classic is incredibly versatile. You can add raisins or nuts, or substitute the apples or berries for other fruits to make it your own. The bars can be kept for quick snacks at home or sent in lunchboxes quickly. For a vegan baked oatmeal recipe that uses agave nectar instead of sugar, healthy baked oatmeal is another delightful dairy-free favorite. If you're looking to save time making this oatmeal for breakfast, prepare the ingredients the night before. Store the dry ingredients, wet ingredients and flax meal in separate containers. When the morning comes, preheat the oven, warm the water for the flax meal mix and combine all ingredients just before cooking in the oven. This will save you time if you have a morning rush. After the bars have cooled, they can be kept at room temperature in air-tight zipper storage bags individually for future use. Be sure to let out the air in each bag before sealing and make sure they are completely cooled before setting aside. Preheat the oven to 350 F. Light oil or grease an 8" square baking pan. In a medium-large bowl, combine the quick-cooking oats, rolled oats, brown sugar, baking powder, cinnamon, salt, and ginger. Set aside. In a small bowl, combine the flax meal with the warm water until the mixture is "goopy". Set aside. In another small mixing bowl, whisk together the almond milk, maple syrup, and melted soy margarine. Add this to the dry ingredients, followed by the flax mixture. Stir until just combined. Fold in the blueberries and apples until evenly distributed. Spread the mixture in the prepared pan and bake for 35-40 minutes, or until a toothpick inserted in the center emerges clean. 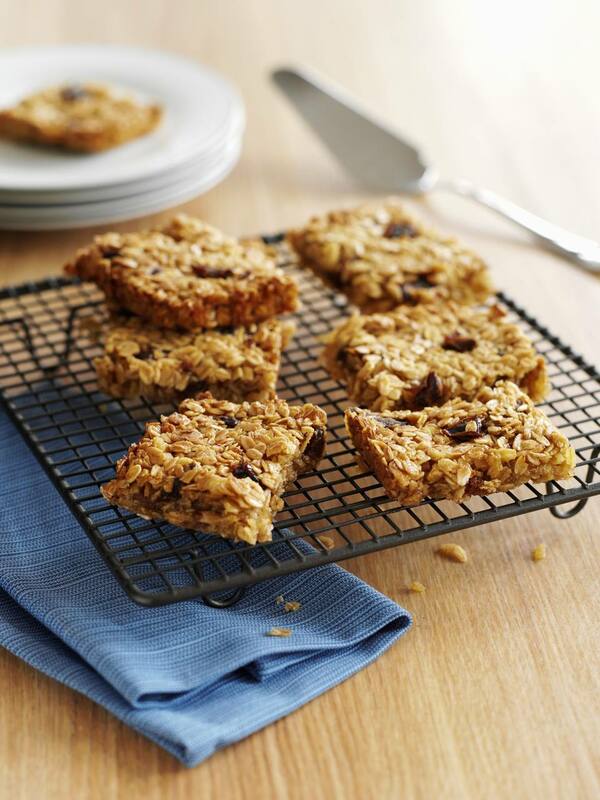 Cut into 8 squares and serve warm with almond milk or soy milk.